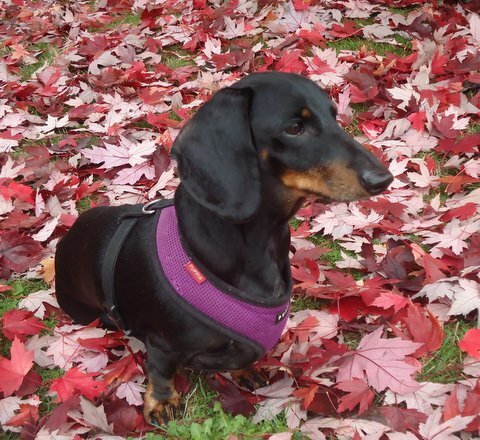 March’s Patient of the month is our longtime patient, ‘Heidi’ Rivard she is an almost 9 year old female dachshund who is one of the happiest souls we have ever met. She has intervertebral disk disease (IVDD), intervertebral disk disease in dogs is a common cause of back pain, rear limb paralysis, and inability to walk or feel the back legs. Certain breeds including the Dachshund, Shih tzu, Pekingese and Beagle are commonly affected. Heidi has paralysis of her rear legs and is unable to consciously move them, with her commitment to physio and hydrotherapy sessions she does have reflex movement of her back limbs upon stimulation, she may get some more mobility with time but most of her sessions are aimed at preventing further damage from occurring. Heidi has some nerve damage and therefore her body is unable to tell her bladder when to contract, so she has to have her bladder manually expressed 2-3 times a day. with excitement, we love this girl!